In a rewarding and high-paying career, like medical sales, representatives must be dedicated and determined. And in the medical device field, it’s sales reps with these characteristics who excel when it comes to their career and compensation. 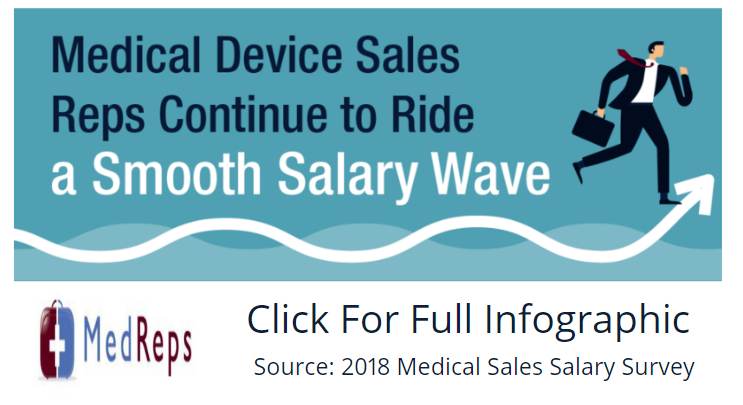 According to our 2018 Medical Sales Salary Survey, medical device sales did see a slight drop in base salary. 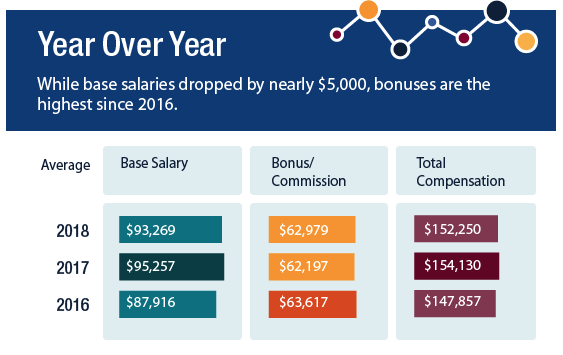 However, a slight increase in commission kept the average total compensation at $152,250, the second highest in the last three years. Respondents who were employed in medical device sales totaled 280. Most of them (62 percent) reported working as field representatives and 78 percent worked for manufacturers. Medical device sales representatives are dedicated to their field. The majority of our respondents (64 percent) have worked in medical device sales between six and 20 years. 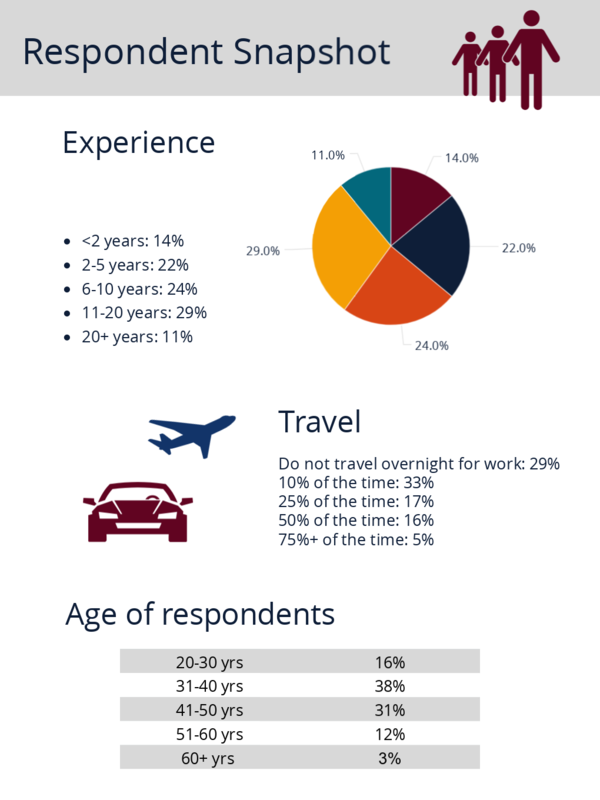 In addition to experience, 71 percent said they travel for their jobs. Medical sales representatives are always pushing to reach the top of their game. Like many reps, those in medical device sales have worked hard this year — and it’s showing. In fact, medical device sales ranks fifth for income potential in medical sales, coming in only slightly behind the top three highest incomes, biotech, surgical device, and medical equipment. The more time and effort reps put into their medical device sales careers, the higher base salaries and total compensation they earn. 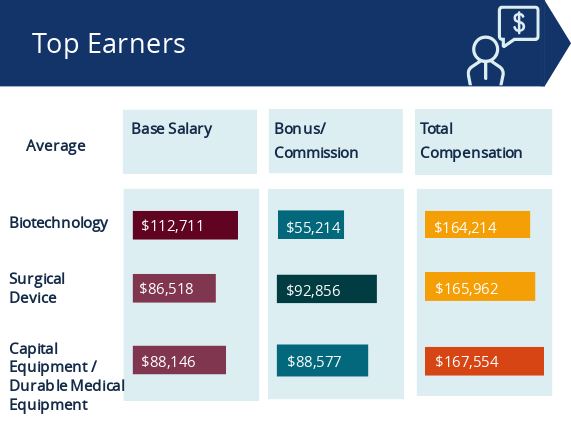 In fact, our respondents who have been in medical device sales for 20+ years earn a base salary of $126,250 and their total compensation is $184,767. That’s nearly $87,500 more in total compensation than those with less than two years of experience. Leadership skills pay off in medical device sales, especially when you combine impressive commission structures and the opportunity for career development. Those in sales management earn a total compensation of $179,074. That’s over $35,000 more than field sales representatives. This large difference comes from more than a $32,000 difference in base salary. When it comes to the highest average compensation, large companies take the No. 1 spot, offering $159,170. However, small companies aren’t trailing far behind with $155,382 in average compensation. This rather small gap is a result of smaller companies offering a higher base salary of $112,125, compared to the $93,478 large companies offer. When it comes down to a race between manufacturers, service providers, and distributors, manufacturers win big offering the highest base salary ($94,889). Distributors trail behind in total compensation at $142,000 and service providers at $113,700, compared to the manufacturer total compensation of $159,630. Getting out on the road is a major aspect in medical sales jobs, especially when it comes to connecting with customers. Those who travel 75 percent of the time or more in medical device sales bring in the highest total compensation ($162,923). That’s almost $47,000 more than what those who don’t travel earn, which is $116,019. 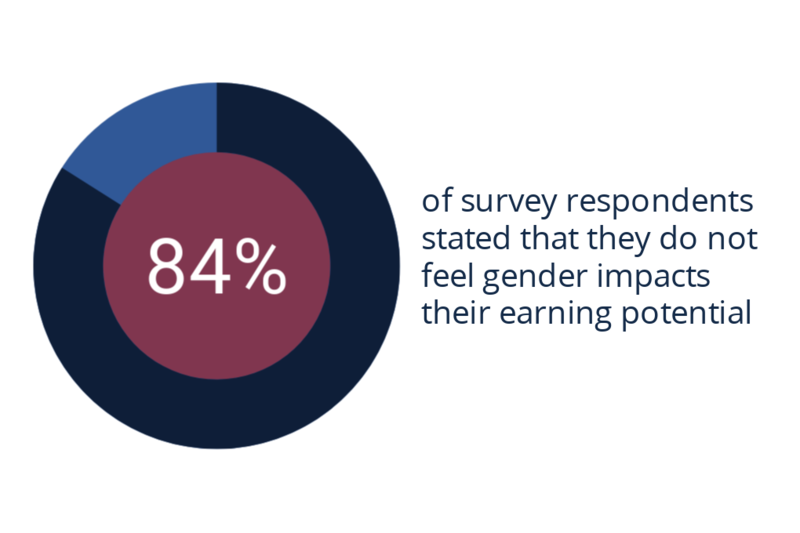 Most respondents (84 percent) do not feel gender impacts earnings. In fact, only 12 percent feel their gender has a negative impact on how much they earn. However, the continued pay gap in medical device sales is undeniable. Females earn an average total compensation of $136,744, which is significantly less than their male counterparts who earn $158,940. This enormous compensation gap is a result of both lower bonuses and base salaries set for women in this field. Women earn a base salary of $84,700, while men earn $97,306. And when it comes to bonuses, women take home just $54,110, while men earn a whopping $66,910. So, where is this major pay gap coming from? We found just 17 percent of women hold the highest paying job titles including sales or marketing manager, director, or VP. 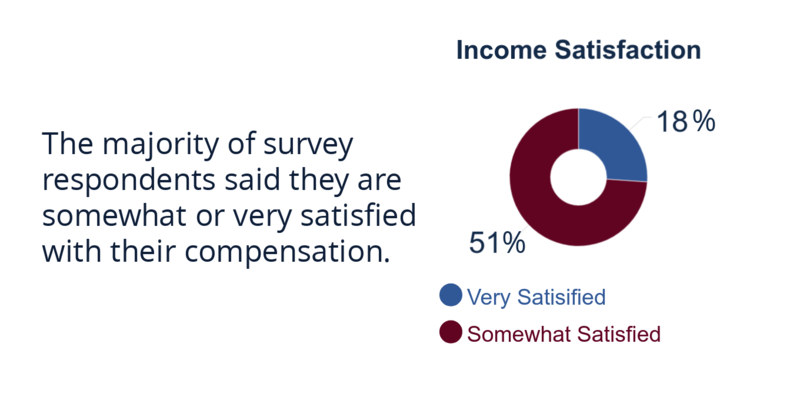 Medical device respondents tied with surgical sales respondents for the lowest level of income satisfaction. Still, 69 percent are somewhat or very satisfied with their income. When it comes to their overall job satisfaction, medical device reps are just as satisfied. In fact, 76 percent say they’re somewhat or very satisfied with their jobs. Medical device sales reps are reaping the rewards of their hard work. From high base salaries, impressive commission structures, and great perks and benefits, these reps are truly enjoying their careers. If you’re passionate about helping others live their best lives, are determined, and like creating strong relationships with clients, this is the perfect career for you.